1 Nestled along the northeastern coast of the United States is the New England Subregion. It is part of the Northeast Region. Filled with mountains, valleys, and forests, this subregion is packed with a variety of landforms that attract tourists year-round. These travelers come from all over to enjoy all the sights and flavors New England has to offer. New England's natural resources are very important to its economy. 2 Our first stop on our tour is New England's coastline. All the New England states except Vermont have an Atlantic Ocean coastline. If you look at a map of New England, you will notice that Maine's coastline is jagged. It has high, rocky cliffs. These areas of high rocky land are called promontories. Once we travel past Maine's peninsula, the rocky coast gives way to sandy beaches. The land juts out as we move south and onto another peninsula. This peninsula is called West Quoddy Head Peninsula. It is the easternmost point of the U.S. People visit these beaches during the summer. There is also fishing year-round. 3 The shape of the coastline has produced many bays, sounds, and islands. Sounds are long, wide areas of water. They separate the mainland from an island. Sounds may also connect larger bodies of water. Nantucket Sound separates Nantucket Island and Martha's Vineyard Island from Massachusetts. Block Island is separated from Rhode Island by the Rhode Island Sound. 4 Bays are small bodies of water close to the coastline. They are surrounded by some areas of land. 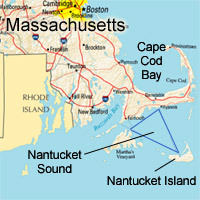 Massachusetts Bay and Cape Cod Bay are two of New England's famous bays. Penobscot Bay is hidden among Maine's rocky coastline. These bays, islands, and sounds contain one of New England's most valuable resources: fish. Shellfish like clams and other fish like cod are caught in these waters. Lobsters are one of Maine's most important products. People in New England and around the country enjoy this shellfish. Crabs, herring, and haddock are also caught in New England. If you find yourself in New England, make sure to sample the seafood! 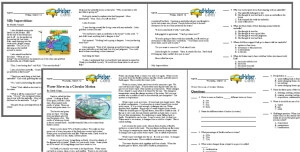 5 As we travel inland, we will see the mountains, valleys, and rivers of New England. The Connecticut River Valley is home to many farms. Fertile soil and flat land support the area's many vegetable and fruit farms. There are also farms that raise animals. Flowing through the center of this valley is the Connecticut River. It is the subregion's longest river. It begins in New Hampshire. The river then flows through New Hampshire and Vermont along their border. It finally empties into the Long Island Sound in Connecticut. Other rivers in New England are the Penobscot River, the St. Francis River, and the Merrimack River.